Road accident fatality statistics show that there is a drastic increase in the risk of death or serious injury resulting from motorcycle accidents. Around 3,000 motorcyclists lose their lives each year on average and many more are seriously injured in accidents. Statistics also show that in most cases, if the operator is riding responsibly and obeying traffic laws, they are usually not the party at fault in the accident. If you have been injured in a motorcycle accident and you know you weren’t at fault, call the Glenn Law Firm. They have helped scores of motorcycle riders in the Dallas-Forth Worth area and beyond win compensation for their injuries and their pain and suffering. Don’t Wait – Call Today! It is important to realize that the law does limit the time you have to take certain legal action related to your accident. If you or someone close to you c contact the Glenn Law Firm as quickly as possible, you may be entitled to recoup all of your losses and collect for things like lost wages, medical expenses, pain and suffering and emotional distress. None of these are ever a guarantee, but the attorneys at the Glenn Law Firm are committed to getting you the compensation you deserve and will fight aggressively to make sure that the responsible party pays. When you call the Glenn Law Firm regarding your motorcycle accident, the chances of a win and a substantial settlement or judgment increase in probability if you can provide a police report made at the scene along with the name, license, and insurance information about the other driver. These are the most important pieces to the puzzle. Even better would be any photos taken at the scene and any witness statements not included in the police report. The more ammunition you provide your Glenn Law Firm attorney, the easier it will be to fire back with a strong claim. Latent Injuries and Shock. It is not uncommon to experience latent injuries (injuries with no immediate symptoms that get worse over time) as a result of a motorcycle accident. Severe shock can also mask the symptoms and pain associated with an injury. Do not take any chances. See a doctor immediately. Do not decline medical attention at the scene. The Glenn Law Firm will be able to build a much stronger case for you if you seek immediate medical attention after the accident. Even if you are convinced that you are not injured, failing to seek medical care following the accident could complicate the process of collecting damages. You owe it to yourself to ensure that you are duly compensated for injuries that occur through no fault of your own. The Glenn Law Firm is here to not only fight for what you are owed, but also to protect you against anything that might stand in the way of that happening. 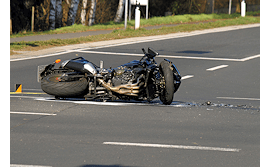 If you are the loved one of a person who has been killed in a motorcycle accident, it is important to seek legal representation as soon as possible. The Glenn Law Firm realizes that this is a time of emotional upheaval for you and will do everything possible to ensure that the process of seeking and recovering damages for your loss is handled professionally and compassionately. Call and provide as many details as you can. Your Glenn Law Firm attorney will piece together the situation and strive to get you through this emotionally taxing time as swiftly and easily as possible. They are committed to helping people in the Dallas-Forth Worth area through these difficult times and making it easier to get on with life in the face of such tragic loss. There Is Hope — Call Us Now. Have you been injured in a serious accident caused by the negligence or wrongdoing of another? Your situation may seem dire, but there is hope. An experienced personal injury lawyer can help you turn things around. Call us at 817-424-5999 or contact us online to arrange a free consultation with an experienced Dallas-Fort Worth motorcycle Accident lawyer. We bill on a contingent fee basis, meaning…If There Is No Recovery, There Is No Fee.